Warroad has the Oshies, the Bouchas, the Christians. Roseau has the Stordahls and the Brotens. Bloomington Jefferson has the Bianchis. Edina, Eveleth, International Falls – all of the state’s greatest high school hockey programs have been stocked and re-stocked by famous hockey families. No name is more tightly linked to its high school than the Peltiers to St. Paul Johnson. Johnson without the Peltiers? The Peltiers without Johnson? Unthinkable on both counts, as impossible as hockey without a stick. 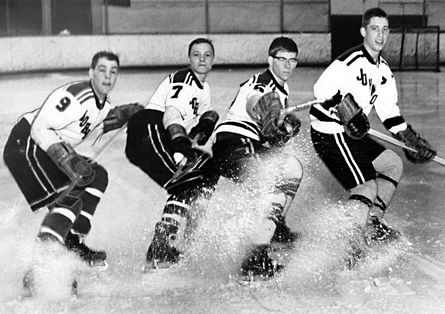 The Peltier brothers – Skip, Ron, Doug and Bob from oldest to youngest – made a combined 11 state tournament appearances for the Governors from 1963 through 1971. It’s no coincidence Johnson was a Twin Cities powerhouse during the Peltier era. The Governors made an astounding 17 state tournament appearances from 1951-71. If hockey is a religion in Minnesota, the worship was taken to cult-like extremes in the Peltier household and surrounding neighborhood. Peltier said he lived four blocks from Herb Brooks, who was a standout high school player at Johnson before going on to coaching stardom at the University of Minnesota and in the Olympics. Other Johnson greats were sprinkled throughout the neighborhood, all of them with hockey sticks glued to their hands. Peltier, a former high school coach and athletic director who worked at Roseville and Forest Lake high schools, said the Saturday and Sunday afternoon shinny games were so competitive crowds would form just to watch. Doug’s time would come soon enough. As a sophomore and junior – freshmen didn’t play for Johnson during that era as the high school was limited to grades 10-12 – Doug played right wing on a line centered by his brother Ron. As a senior flying solo after Ron’s graduation, Doug powered Johnson to yet another state tournament appearance in 1968. Ron Peliter was the St. Paul City scoring champion in 1967 with 31 points. Doug finished second in the city scoring race that year, and as a senior won his own St. Paul scoring crown with 33 points. Doug and Ron were reunited at the University of Minnesota, where they promptly were placed on the same line. With those two playing starring roles, the Gophers made an unlikely run to the national championship game in 1970-71. As a senior, Doug scored 22 goals and added 14 assists and was named the Gophers’ MVP. Skip, Bob, Doug, Ron and their older sister, Kathy, all were inducted into the St. Paul Johnson Hall of Fame as a family in 2008. "I have waited 50 years for this,” longtime Johnson hockey coach Lou Controneo said during the induction ceremony. “To me there never was any doubt about who was the 'best family' on the east side or at Johnson High School. "You have raised the bar very high."